Flemish anatomist who, as a university teacher insisted on conducting detailed dissections on human cadavers personally. Vesalius was the teacher of Gabriel Fallopius, who was in turn tutor to Hieronymous Fabricius, who then taught William Harvey. This lineage can be said to have started the modern science of medicine. [p.5] The first attempts made in Christian Europe to revive the study of medicine sought to go back to the Greek and Roman school represented by Hippocrates, Galen, and Celsus. Paracelsus (1490? -1541) was the first to hold himself independent of both the Graeco-Roman and the Arabian schools. He was an astrologer and an alchemist and sought to find a remedy whose “spirit” was opposed to the “spirit” of the disease. Remedies were supposed to contain the essences of the things from which they were drawn. His familiarity with alchemy led him to introduce chemical remedies such as laudanum and antimony. About this time Vesalius (1536-1564) began his work of correcting in many details the anatomical ideas of the ancients, and led the leaders of the science to depend somewhat on personal dissection and observation instead of entirely on authority. It is said that the heart of a Spanish noble, supposedly dead, seemed to palpitate under his dissecting knife, and that this brought him before the inquisition where he was at first condemned to death, but the sentence afterward commuted to a pilgrimage to the Holy Land. He was shipwrecked when returning, and died of starvation at Zante. 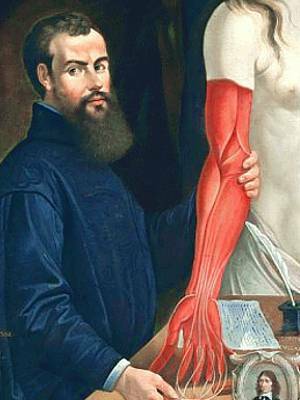 His “De Corporis Humani Fabrica” is the first comprehensive study of anatomy in modern times. It adds to and corrects in a number of minor points, the anatomy of the ancients, but his great work was to bring men to see things for themselves. We now come to the discovery of the circulation of the blood and the beginning of physiology. The Galenic doctrine of the action of the heart and blood was that the blood in the left ventricle of [p.6] the heart ebbed and flowed along the arteries, the blood in the right ventricle along the veins, and that part of the blood of the right side of the heart found a mysterious passageway to the left side through invisible pores of the wall of the heart (septum). Servetus (1511-1553) guessed that there was some sort of circulation through the lungs, but when he was burned at the stake by Calvin, almost all copies of his book, the “Restitutio,” were burned with him. Caesalpinus (1519-1603) also had some glimmering of the truth, but it remained for Harvey to extend and prove the theory and to show its important bearings. Science Quotes by Andreas Vesalius. 31 Dec - short biography, births, deaths and events on date of Vesalius's birth. Andreas Vesalius - biography from Penny Cyclopaedia (1843). The Illustrations from the Works of Andreas Vesalius of Brussels, by J.B.deC.M. Saunders and Charles D. O’Malley. - book suggestion.